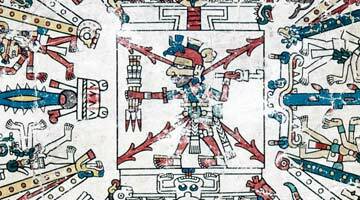 Aztecs in Liverpool, Walker Art Gallery, Liverpool, 3 July – 26 October 2014. Part of the Liverpool Biennial. The celebrated composer Michael Nyman, best known for his soundtracks to several Peter Greenaway films and to Jane Campion’s 1993 film The Piano, has turned photographer and film-maker. His two-screen video installation Aztecs in Liverpool was inspired by his first encounter, on a visit to Liverpool, with the late 15th to early 16th-century, Aztec Codex Fejérváry-Mayer, owned by World Museum Liverpool, the Walker’s near neighbour. A reduced-size 4-metre replica of the Codex will be shown within the display. Nyman has used the rituals and format described by the Codex pictograms as a conceptual framework for the still and moving images of Mexican street-life and high art – from pre-hispanic artefacts to contemporary culture – which he has captured over the past 20 years in his newly adopted home of Mexico. Nyman’s visual engagement with Mexican regional traditions, rituals and music is also influenced by Mexican literary and visual artists particularly their street photographers, whose work he collects. For conservation reasons the original Codex will not be on display in either the Walker of World Museum Liverpool. This entry was posted in Latin America and tagged Exhibitions, Installation, Latin America, Liverpool, Liverpool Biennial, Michael Nyman, Walker Art Gallery, World Museum Liverpool on June 22, 2014 by Clare Hills-Nova.